When it comes to choosing a type of grill, pellet grills certainly outshine other options available in the market. It takes the guesswork out of barbecue and you no longer need to babysit the grill by constantly checking its progress, feeding coals, or making sure everything comes out fine. The best pellet smokers are slightly expensive but if you look around you can get a good deal as several manufacturers are now offering competitively priced models in the market. There are so many options available when it comes to pellet grills that deciding which one is good for you can be really difficult. The average buyer can be baffled by questions like – should I buy the most popular model by a well-known brand? Should I get the most expensive one with advanced features? Should I choose the grill that offers the best price to performance ratio? If you are in a similar situation, take a deep breath and consider these five important things when buying a pellet grill. Price – Cheap and affordable are two different things and they should not be confused. Cheap grills don’t last for long and the parts start rusting and breaking down faster than you think. However there are some really good affordable options available that are worth buying. Quality of construction – Invest in a grill that is made from good quality material. The lid should not be flimsy or lightweight. It should be durable, sturdy and well built. Temperature range – Pellet grills offer an indirect style of cooking so a good model should be able to maintain a temperature range of 180°F to 425°F. For searing, you need a temperature range of 500-550°F. Temperature controller – One of the biggest advantages of pellet grills is that they come with controllers to adjust the temperature and keep it at an average of 250°F. Size and cooking area – Depending upon your preference and lifestyle, you may want to look for pellet grills that are compact and portable, or extra-large for camping purposes. You can also find built-in models designed for outdoor kitchens. Here are short reviews of some of the best pellet grills available in the market with features, pros and cons to help you choose the right one for you. The Davy Crockett is a technology equipped potable grill by Green Mountain, a company that was established in 2008 with the objective to offer smart grilling solutions. Until then, the grill market had been largely dominated by Traeger and Green Mountain has worked hard to pierce through the Traeger dominance and create its own position. This grill works on open flame technology and it comes with an advanced sense-mate thermal sensor that constantly regulates the temperature inside the grill. It can run on a source of 12 Volts so it’s the perfect companion for barbeque nights at the backyard, camping, hunting, or just any outdoor event. The biggest advantage of this pellet grill is that you don’t have to spend hours in front of the grill to get that perfectly roasted meat. You can set the desired temperature and spend time with guests. The Wi-Fi controller allows you to keep an eye on the grill from any corner of the house. The grill is lightweight and highly portable hence it can be carried to any location with ease. It has a good grilling capacity and you can easily cater to a small group of friends. The customer support is helpful and easily reachable. Wi-Fi control makes monitoring easier for the cook. Installing the grill is simple and takes a few minutes. No need to constantly adjust temperatures so anybody can grill. The Davy Crockett is an intelligent grill that promises to take the stress out of your favorite pastime and treat you with perfectly grilled steaks and ribs every time. The advanced features, coupled with good performance, make it a strong contender in the grill market. At this price, we can’t ask for more. The exterior facade of the Pit Boss 71700FB Pellet Grill exudes class and it looks perfect for those summer barbeque nights. It boasts 700 inches of cooking area so you can cook a variety of foods and invite friends for an outdoor party. It also comes with a second tier rack to add versatility to the grill. This 8-in-1 multipurpose grill can be used for a variety of cooking styles such as smoke, grill, roast, sear, bake, barbeque, braise or char-grill. It can be set to a temperature range of 180 to 500 degrees as per your preferred style of cooking. The standard flame broiler with a digital control board allows you to cook your food slow and low without worrying about burning it. You don’t have to constantly worry about increasing fuel or ensuring that heat is evenly distributed throughout the grill. You just need to set the required temperature range and let your food cook slowly while you enjoy the party. The natural hardwood pellets release a distinct aroma that lends an exotic flavor to the meat. The high grade steel components add strength and durability to the product, making it last for long. Hence, it offers good value for money. It boasts a large capacity that allows you to fire up delicacies for an entire party. The grill gets hot enough to cook different types of meat with perfection. It does not take up a lot of space in the backyard. It gives you hassle free cooking without any mess. This is a highly versatile grill and easy to clean as well. It is easy to install the grill following instructions in the manual, hardly takes a few minutes. 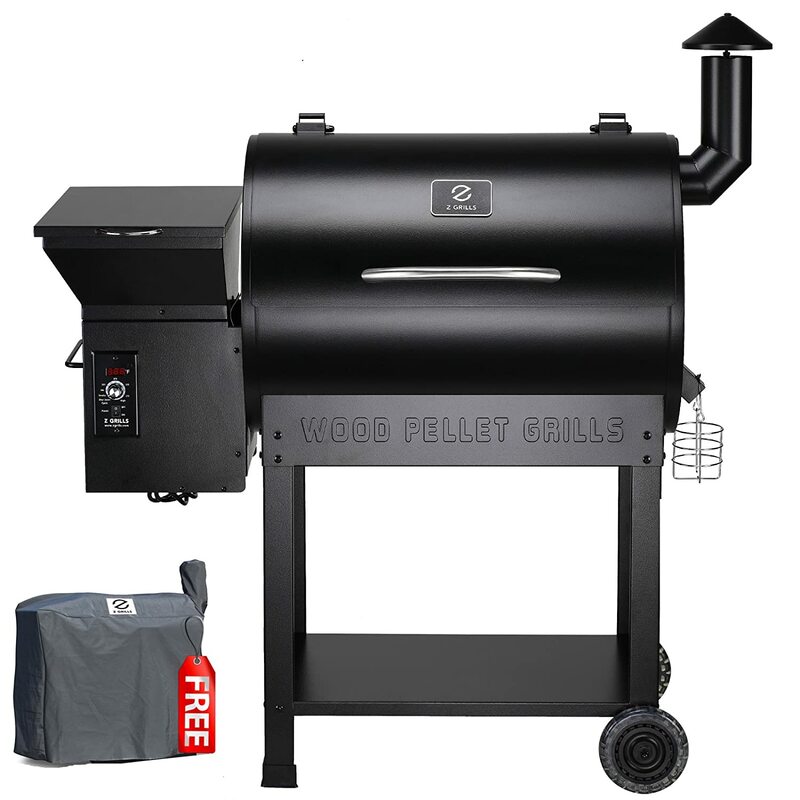 The Pit Boss 71700FB Pellet Grill is an affordable option to Traeger and it delivers exceptional performance. Although it lacks a chimney and side trays, these things don’t interfere with the functionality and quality of this grill. The TFB65LZBC Texas Elite 34 Series comes from the house of Traeger who are undisputable market leaders in the wood pellet grill industry. 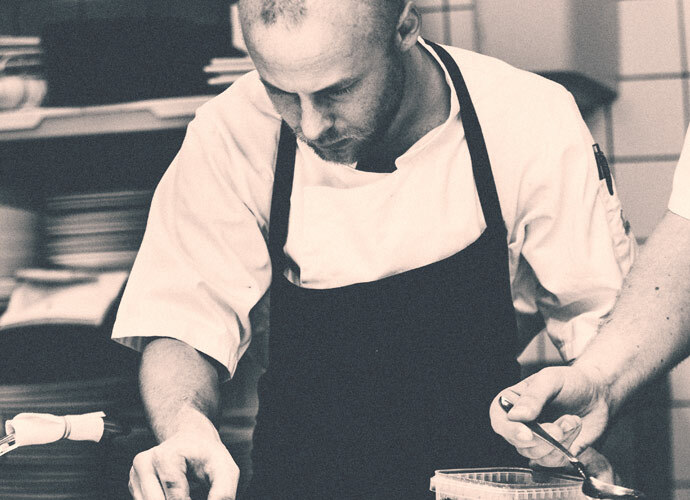 They have dominated the grilling scene for over 25 years and even today very few brands can challenge their supremacy. The TFB65LZBC masters the art of wood fire cooking and promises succulent and aromatic delicacies every single time. The portable grill comes with 646 inches of grilling area that can easily cater to a family of four. It is also perfect to serve a small group of friends. The product comes equipped with a digital elite controller which sports an LED display to help you maintain the perfect temperature range needed to perfectly roast, grill or bake your food. The grill gives you the pleasure of authentic wood fire cooked meals without the hassle and mess that comes associated with them. The wide legs add stability to the product and it comes with attached wheels so you can easily take it in or out of the house. It delivers a robust wood-fired convection performance. It sports a simple operating system that makes grilling easy for beginners. The advanced Digital Elite Controller keeps the food on high temperature for the first 4 minutes and then then temperature drops for slow and low cooking. The installation is simple and easy to do. The large grilling area can cook a lot of food at once. Load the hopper with hardwood pellets and you don’t have to worry about reloading. 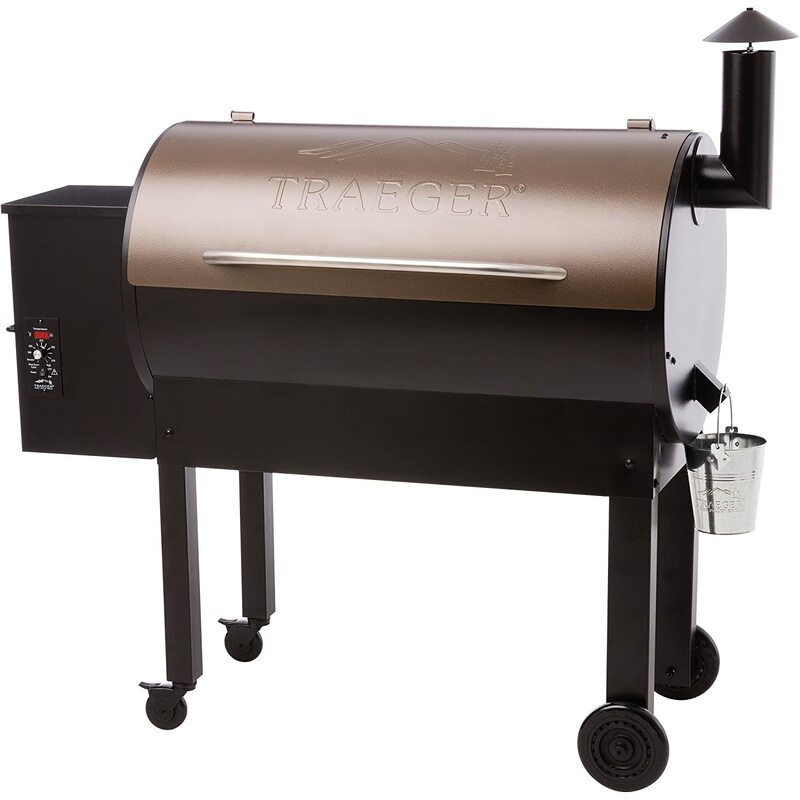 The Traeger TFB65LZBC Texas Elite 34 Series is definitely more expensive than other grills available in the market. However, the kind of performance and end result you get from this grill is incomparable. If you can afford to pay the price, this is undoubtedly one of the best grills that will last for long. 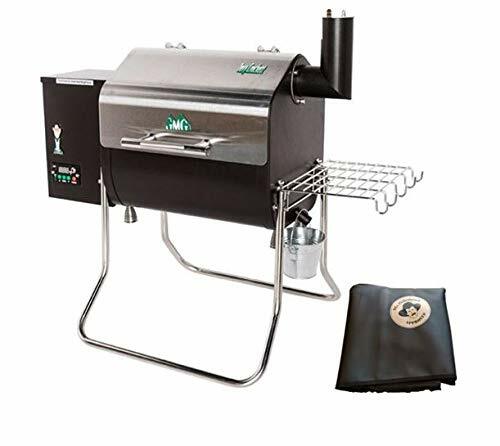 The SmokePro DLX Pellet Grill is one of the top rated pellet grills manufactured by Camp Chef, a company that hopes to revolutionize outdoor cooking. It gives an affordable and easy solution for barbeque enthusiasts to enjoy rustling up wood smoked delicacies in their backyard. The external build of the SmokePro DLX exudes class and its compact form doesn’t fail to impress. The SmokePro DLX Pellet Grill is thoughtfully designed with a plethora of features that make it a perfect backyard grill. The back legs come with wheels, making it easier to take the pellet smoker in and out of the house. 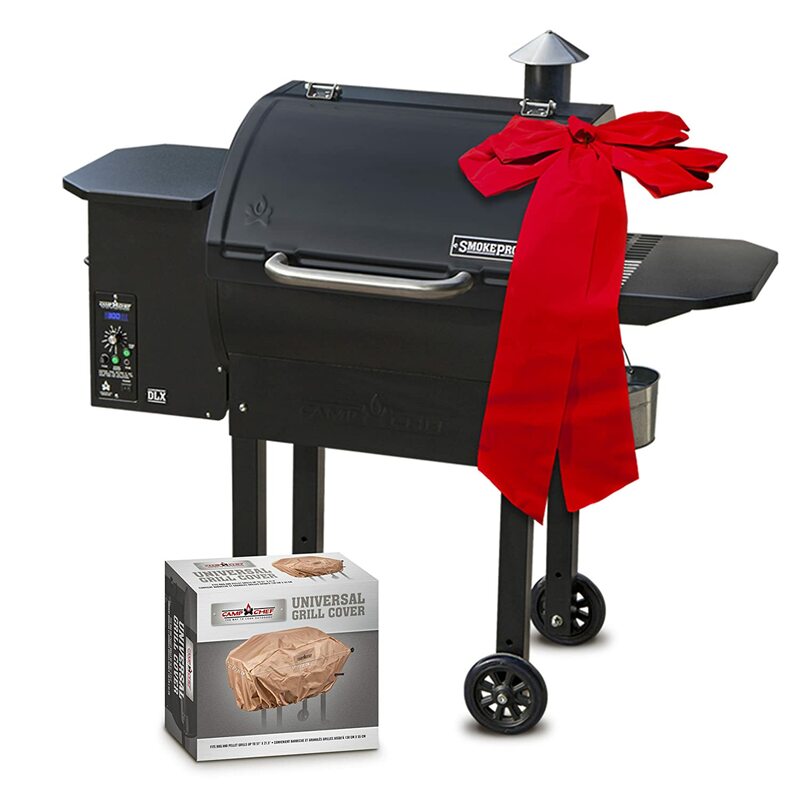 It comes with an advanced ash cleanout system that makes it easier to clean the grill after each use. You simply need to pull the level and empty the accumulated ash from the fire box. The smoker comes with 573 square inches of grilling surface that can cook enough food for a family of four or a small group of friends. The pellet hopper also has a large capacity that can hold about 18 lbs. of pellets which means more smoke and less reloading. While the grill delivers a good performance, we cannot ignore that the external framework appears fragile. The manufacture has compromised with the quality of materials used in making the grill in order to keep the cost low. It includes a meat temperature probe which is a great addition at this price range. It’s so simple to use that even beginners can also prepare perfectly grilled meat. It includes a sear box that gives perfect crustiness to your meat. Installation is easy and takes about 30 minutes. It includes features of a high-end grill at an affordable price. Digital display shows the temperature so you can enjoy the party without having to stick by the barbeque. The low-quality construction of the SmokePro DLX Pellet Grill gives it a shorter life span. Despite the few downsides, Camp Chef manages to pack a powerful punch with this model. It delivers a good performance at an affordable price. Z-grills is an authentic US brand that takes grilling to a different height altogether. The wood pellet smokers by this company are fueled by natural hardwood pellets that help you achieve that perfect taste and aroma. With a large grilling space of 700 square inches, you can call your neighborhood for a summer feast and show off your grilling skills. The model works as a barbeque, grill and smoker that can be set to a particular temperature. It has a digital control board that displays the temperature inside the grill so you don’t have to stand by it all the time. You can watch the TV or entertain your guests while the food is grilled with precision. The Z-grills smoker enables convection style cooking. It comes with a fan that creates a favorable environment for smoking, roasting, braising, grilling and baking. Risk free purchase with 30 days money back guarantee. Set the temperature and forget, no need to baby sit the grill. Gives you authentic wood flavored meat. Grrll, roast or bake like a pro every single time. The Z-grills grill is compact but its design does not compromise with its quality. The easy controls and simple functions make it easy for anyone to be a grill master. However, we feel it costs slightly more than competitor products and this may be a constraint for some. You need to first ask yourself what you are looking for in a pellet grill. Make a list of things that are important for you. Do you want a grill that doesn’t take up a lot of space? Are you looking for an affordable model or something that lasts for long? The five products mentioned above are the best pellet grills available in the market. To pick the one that suits you, consider your personal preferences, budget and lifestyle. If you grill often and enjoy inviting family and friends for a delicious treat, we would recommend that you invest in a grill that’s sturdy and lasts for long, such as the Traeger TFB65LZBC Texas Elite 34 Series. 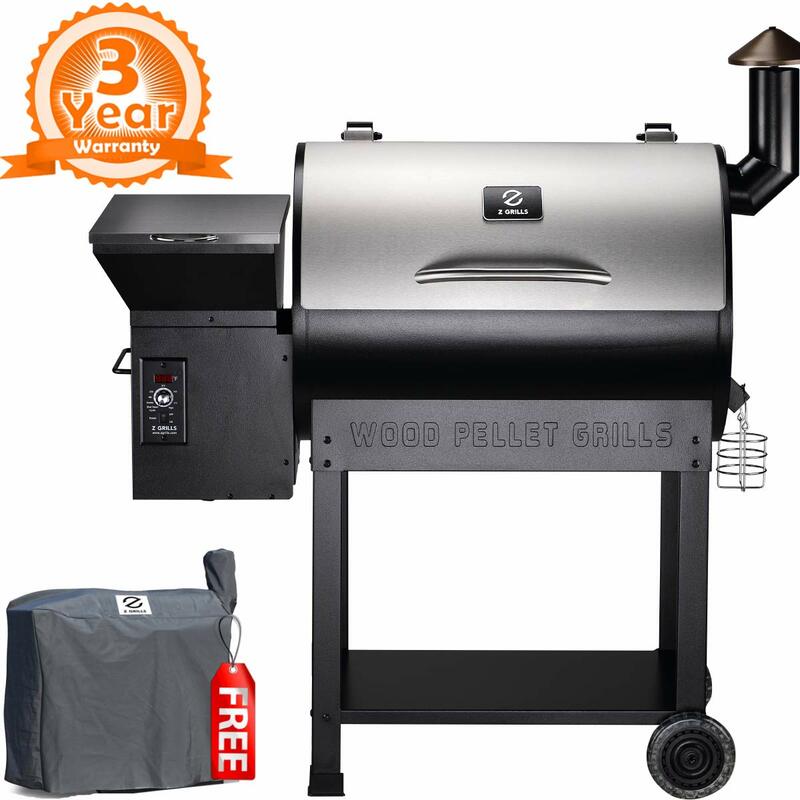 On the other hand if you want a low cost grill that allows you to enjoy the pleasure of savoring succulent and aromatic briskets and steaks once in a while then you may choose the Pit Boss 71700FB Pellet Grill with Flame Broiler. Camp Chef SmokePro DLX are a class apart and we would recommend these stylish and feature-rich pellet smokers to those who grill frequently and don’t mind paying a high price to get the best in quality! I needed a multi-purpose grill that would allow me to not only BBQ but also smoked chicken or even roasted. The PIT Boss 71700FB Flame Boiler was the perfect candidate for me. The best part is that it is ideal for those bonfire dinners that we love to keep during the night while camping out. It is definitely a space saver and the hardwood pellets gave the meat an additional mouthwatering flavor. I made the decision to try grilling on my own. As a result I decided to try the Green Mountain Grills Davy Crockett Pellet Grill. I was able to set the temperature and do other things in between. How??? This grill comes with a Wi-Fi controller that allowed me to monitor it from inside the confines of my home. I am pleased to say that my grilled chicken came out perfect! My personal preference is an easy to use grill that is innovative and has a large enough space for my family. I love to cook and so this Traeger TFB65LZBC Texas Elite 34 Series Wood Pellet Grill was my first love. The LED display screen adds that innovative touch that I am drawn to. Not to mention the ignition that is auto started by electricity. The authentic natural flavor that comes from the wood is so amazing! We already own a grill but the needed an upgraded one that is more durable. I was introduced to the Z-Grills Wood Pellet BBQ Grill and Smoker and I do not regret my purchase. Imagine having a 7-in-1 barbeque grill that allows you to not only cook for your guests but also entertain them personally, all because of the digital control board affixed to it. With my 3 year warranty and its durability I do not need another grill.